The Marquis Who’s Who listee base is comprised of an expansive variety of accomplished professionals, whose specialties are far-reaching and diverse. As the world’s most preeminent biographical publisher, we pride ourselves on our ability to archive, translate, communicate, and honor our listees’ robust backgrounds, and we are constantly challenging ourselves to find new and distinctive ways to present the legacies and career histories of each individual associated with Marquis. We understand that it can be challenging for seasoned professionals to amass and publicize their career experience and triumphs. 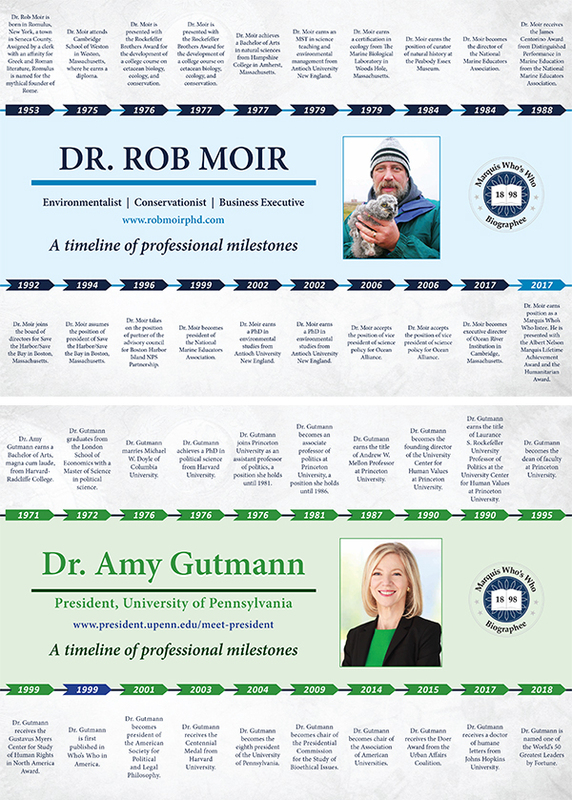 In an effort to assist in this regard, we are proud to create personalized timelines that articulate the most notable milestones of our listees’ career histories. Visual and web-friendly, each listee timeline provides readers with an easily digestible outline of relevant career successes. If you are interested in the Milestones program, please contact us to arrange an appointment with one of branding specialists.